Evergreen has been helping transform school grounds across the country for years. 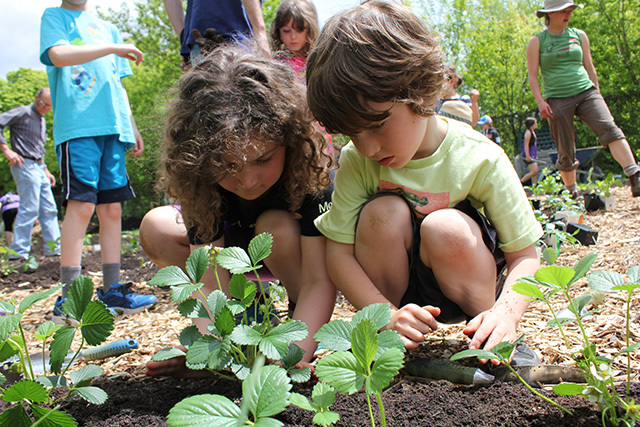 When we first began working in school grounds, it was a way to bring classrooms outside, inspire educators to create lesson plans around nature and get students to experience loose-parts play and connect to their natural environment. While that is still the case today, transforming school grounds is now recognized as a potential solution to incorporating resilient infrastructure throughout our cities. The Limestone District School Board (LDSB), an Evergreen partner, in Southeastern Ontario, with 57 schools and 8 education centres, has been taking the opportunity with new projects to integrate practical solutions for naturalization and climate adaptation. Inadequate drainage results in large puddles and erosion on many school grounds. With the installation of a rain garden comprised of native plants and grasses, a school will gain areas where water can permeate, mitigating flooding not only of the property but also of nearby streams. Adding to the urban tree canopy, new trees planted on school properties help prevent erosion and provide cleaner air for students. Planting native species around the school ground means more water absorption compared to grass. Native species also attract more pollinators to the area, adding to the biodiversity. Using a mixed planting pallet also avoids monocultures making the landscape more resilient to the uncertainties of changing conditions. Mulch was used throughout the school ground as an absorptive landscape material. It suppresses invasive weeds and helps reduce the watering requirements throughout the property. An integrated shade structure provides a practical use in offering much needed shade/shelter to students and it also provides a framework for climbing plants. 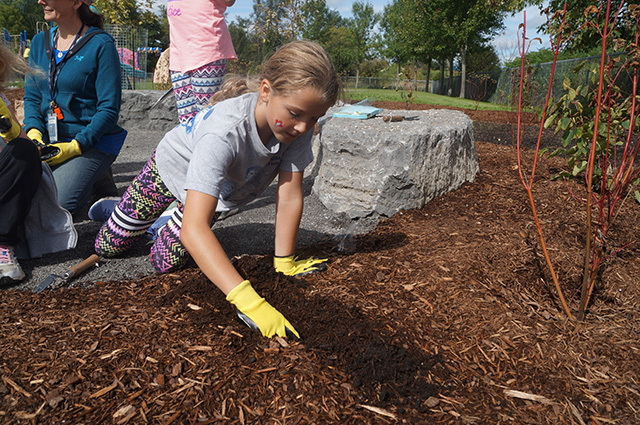 Some of these changes may not seem ground-breaking, but they work together to create a resilient outdoor space for the school and the community. Learn more about Evergreen’s work with school boards across the country and discover more about LDSB’s recent project at Elginburg & District Pubic School, through our case study.